Terry Mason, David Skinner and Joshua Parr are pictured with competition-winning pupils from Blackboys Primary School. Blackboys Primary School has won a prize for having the best innovative idea in a competition run at the Millennium Seed Bank, Wakehurst. Twenty schools competed and Blackboys achieved success with a Trash to Treasure idea which involves taking discarded items and recycling them into valuable resources for the community. Second in the competition was Framfield with a floating solar panels idea. The competition is called ROAR and run by Lions Clubs International and the ideas company 7billionideas. Its aim is to “unlock the creative spirit in every child by giving them the time to imagine and develop ideas that could change the world”. Blackboys and Framfield schools were supported on their way by Uckfield Lions Club. 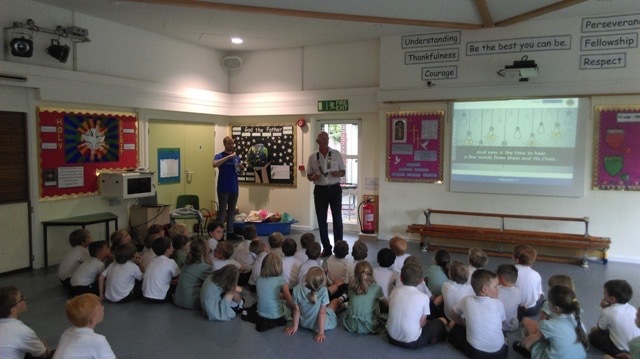 A special assembly was held at Blackboys school to celebrate success. 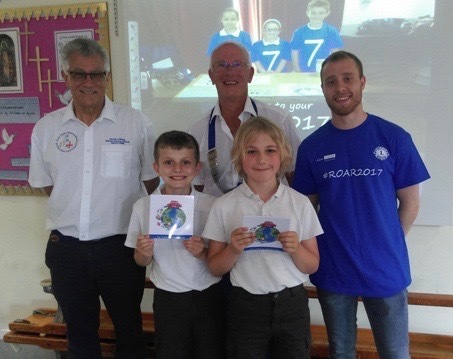 Guests included Uckfield Lions president David Skinner, past district governor Terry Mason who represented ROAR, and competition manager Joshua Parr from 7billionideas.